Michael J. 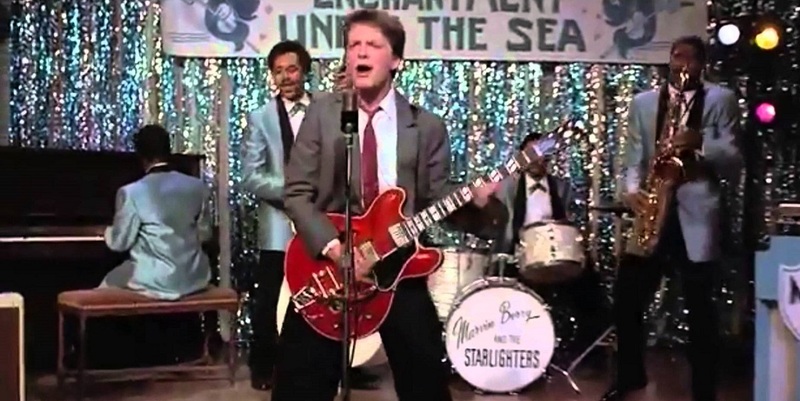 Fox joined Coldplay onstage to cover the Penguins' "Earth Angel" and Chuck Berry's "Johnny B. Goode" – two tracks Fox's classic character Marty McFly performed at the "Under the Sea" dance in Back to the Future. In a video projection, Martin's son Moses asked his dad to play something from "both of our favorite movie, Back to the Future." Coldplay complied, easing into the silky doo-wop classic "Earth Angel," as Martin crooned and strummed an acoustic guitar. Fox walked onstage midway through the track and played a brief, tentative guitar solo, then went on to Johnny B. Goode where he slaughtered the blues rift from B and Coldplay could barely keep up.